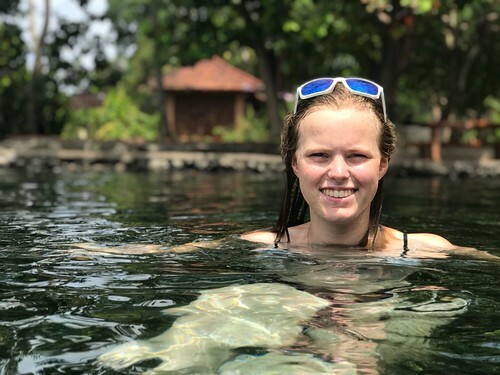 Anke Prinsen – Studying abroad and more.. 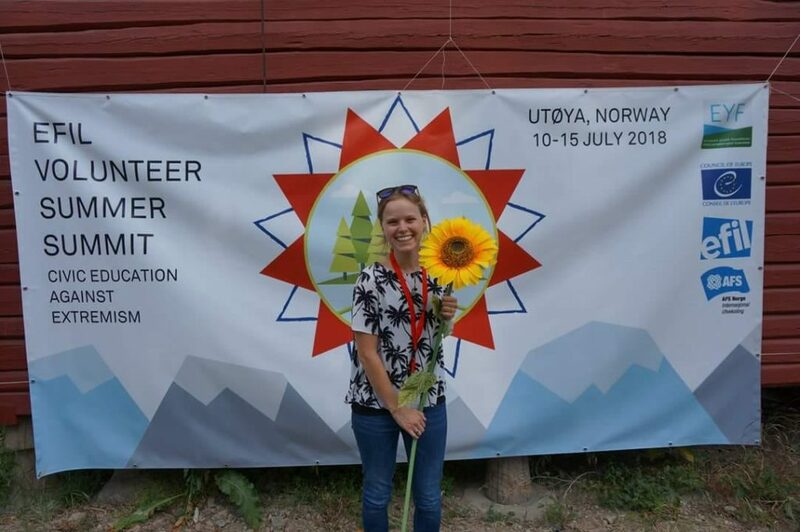 This year I was one of the lucky ones to get a funding for the Volunteer Summer Summit 2018. I want to thank EFIL and AFS Netherlands a lot for this opportunity! I learned a lot, met many great people and had an amazing time on Utøya! The venue was at the island of Utøya in Norway where many people were shot on July 22nd 2011 by a shooter with very extremist thoughts. I think it is an honor that we could talk about this topic at this specific location. The location itself felt really peaceful, which made it unreal that something that bad could happen here. I think it was a good thing to see during the VSS how we can work towards the AFS strategy 2018-2022 to empower people of all ages and all backgrounds with the intercultural knowledge, skills and understanding required to take action and make a positive difference at home and around the world . 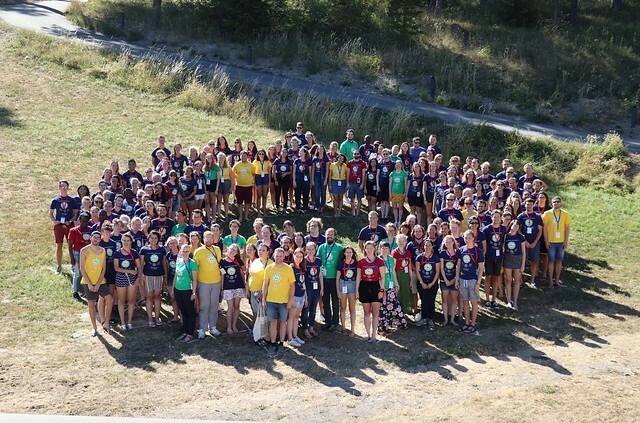 To be together with many AFS volunteers from all over Europe and some other countries outside of Europe was amazing. All people are very open minded which made the atmosphere great at the VSS. It was not really that groups were formed. You could just sit down with whoever you wanted to sit with and have great discussions about serious topics and less serious topics. Also you just had to open your arms and there would be someone around you to give you a hug if you needed it. I think just the way people act with each other at the VSS is part of the great VSS experience! During the VSS I followed three workshops. My first workshop was called: ‘Grandma also has a say’. This workshop was about what view elderly people have and how we can connect that to the AFS spirit. For this it was important to realize when someone belongs to ‘elderly people’. Everyone agreed we cannot just put a number to it. It is just how people feel. And also, there are already gaps in between different generations close to each other. Due to the many mobile devices, social media and other possibilities the young children from now will grow up with a different perspective than the teenagers from now or young adults. It is important to realize this. During this workshop we also talked about how we can get elderly people involved in AFS. Like many people just sit at work and might like to do volunteering work. Or maybe we can do some volunteering outside of AFS at elderly homes to get connected with those people. The most important thing is to start ask people directly for what their needs are and see in what way we can help. My second workshop was: ‘Diversity; a big mess or a useful tool’. In this workshop we talked about diversity, how do people see this and is it a good thing or can it also be bad? First it was our goal to see what diversity exactly means. Also on what aspects people can be diverse. This can be on many aspects from looks to culture and values and beliefs for example. We got the task to divide our group in two as diverse as possible groups as possible. This was pretty hard and we got a very interesting discussion. Like what is the goal behind this, what do we need the groups for? Which aspects do we think are the most important to divide the group? Like we can split up in gender, nationality and looks. But at the same time our qualities within a group might still be the same. The discussion went on for a very long time before we finally managed to put ourselves in two groups before the coffee break where the discussion continued. I think the most important thing from this workshop to remember is groups can be diverse in many ways. And just wanting to be diverse can influence the quality within a team. So people will really have to see in which ways it is best to be diverse to get to the best results as possible. The whole week of VSS was amazing for me! I really loved being there in Norway for this event. There were many interesting discussions, outside the workshops we could just hang out and we did a community project where I went with part of the group to the local Red Cross office to paint. Overall it was a great experience! Below some pictures of the VSS, by clicking on the arrow you can navigate through the pictures. So lately I’ve been trying to talk more and more Bahasa Indonesia, and surprisingly, it goes better than expected. I’m far far away from being fluent. But sometimes I can understand what people are talking about or answer simple questions in Indonesian. *Fun fact Bahasa Indonesia = Indonesian = literally language Indonesia.  So Dutch would be Bahasa Belanda = language Netherlands. There is actually a logic behind the language. I just have to find it. 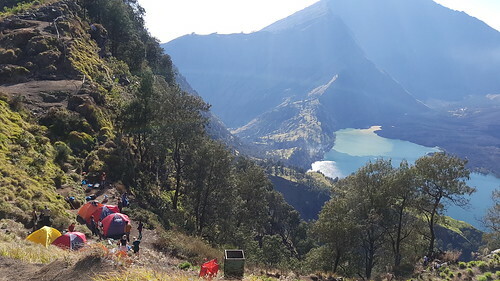 So what does the title: ‘Pengunjung dan Gunung Rinjani’ mean? 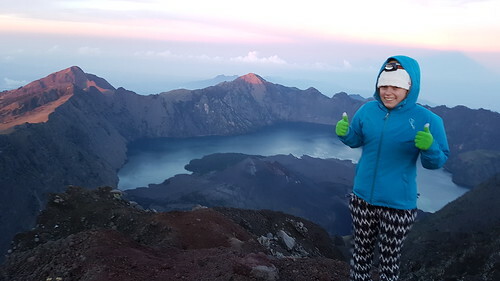 So this blog is about my visitors and climbing the Rinjani Vulcano! Welcome to my new blog! Let’s start with my visitors: MY PARENTS. My parents went to Bali for 12 days. They arrived October 23th on this beautiful island. I just had to go to school and to my project, so I couldn’t meet with them right away. Instead they had their own driver Ngurah who showed them around. 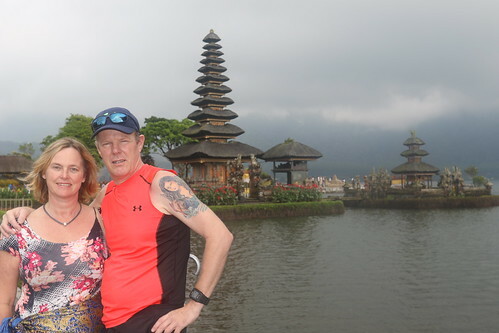 Before I saw my parents they already saw and heard a lot about Bali and they loved it. 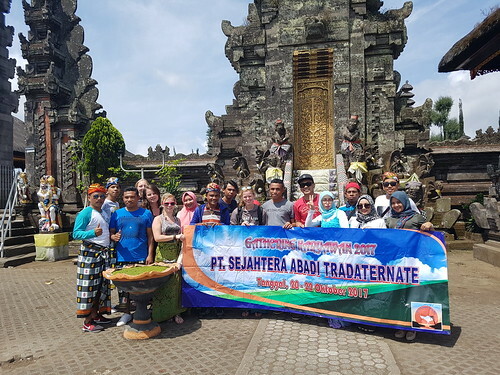 They went to Ubud, Tanah lot, ricefields, tried Luwak coffee and they saw some more temples / places. Thursday was the day I would see them again. It was kinda weird. 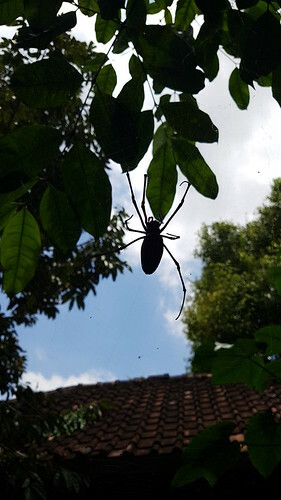 I’d been living on Bali for only a month and they would already visit me. A month goes by really fast, so it didn’t feel like I hadn’t seen them in a long time. It was just a couple of weeks. 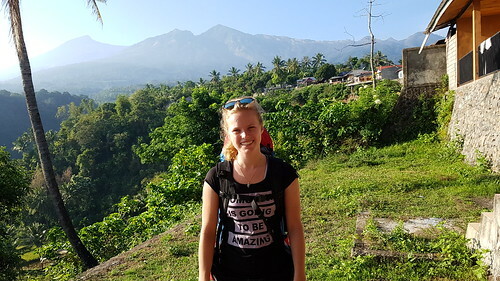 So after going to my project in the morning I went to Lovina later that day with Sanne to welcome my parents. I booked a hotel for them 2 weeks prior to their arrival while I was sitting at the pool of the hotel and video calling with my parents. In the noon my parents, Sanne and I walked to Lovina beach which was very close to the hotel of my parents. Sanne just relaxed at the beach while my parents and I went snorkeling in the sea. First we did not have the best places to go snorkeling (only sand), but a little later we found a spot with some coral and pretty fishes. My parents really loved it! 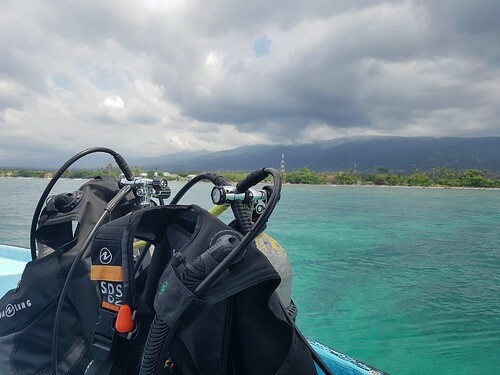 (Orangtua saya suka snorkeling in Indonesian). After we went snorkeling I took the time to enjoy the warm shower in my parents’ hotelroom. The first month I stayed here we did not have warm water in the shower at home because something was going on with the boiler and they didn’t bring the boiler back yet. By now they luckily brought it back after having to shower cold for 4 weeks. So we can finally take warm showers at home again.  At night I showed my parents how ‘cheap’ food could be here, we ate at apple where you can buy a good meal for €2 or cheaper. Way different than the Netherlands where you easily pay €15 for a meal. Here I usually go out to eat because prices are not that high. In the 1,5 months I’ve been here I never cooked at home. I only made some eggs and French toasts. On Friday I decided to join my parents. 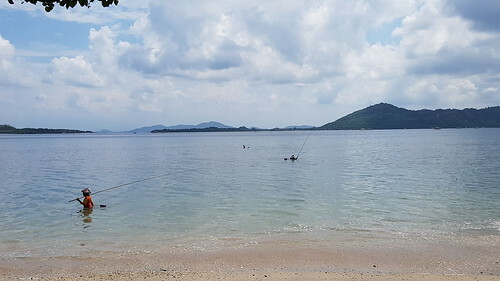 I woke up at 4.45am to watch the dolphins at Lovina, on the way back from watching the dolphins we stopped at the snorkeling point and went snorkeling for about an hour. Then it was time for (second) breakfast at the hotel of my parents. While we ate breakfast Mylène also came. Her project was not working out well and she couldn’t do anything that day. 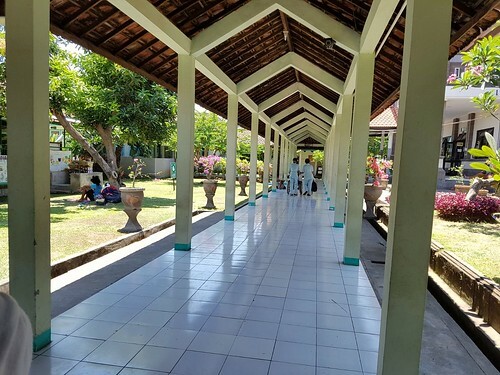 We decided to go to the Buddist temple which is not that far from Lovina. Walking around in Lovina we found a taxi driver who could bring us there and afterwards to Singaraja where I showed my parents where I live during these months. We also ate lunch at the harbor of Singaraja and I brought my parents to the traditional market which is on walking distance from my house. 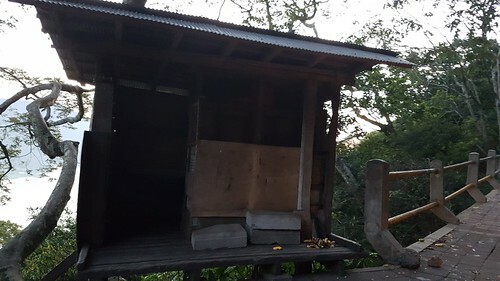 Here my parents bought bananas to give to the monkeys on the way next to the road to the South. Later that day we wanted to go to the waterfall, but this was further to drive and our taxi driver asked more money for that. 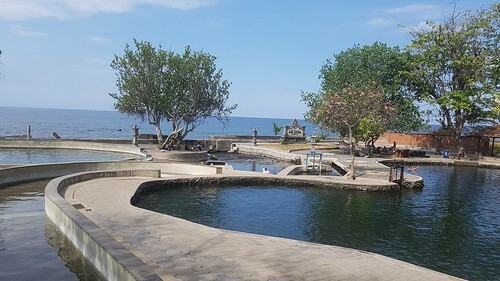 We decided just to go back to Lovina and go snorkeling (again) at Spice Beachclub, the place I have my diving classes at. From my parents’ hotel we had to drive here with the scooter. At the start of our road trip this weekend 👌 We've seen many things and it was a lot of fun! 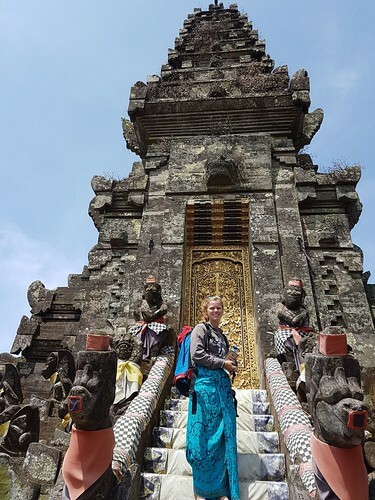 The second stop on the way was at the temple Tirta Empul. Here we were able to ‘clean’ ourselves in the holy water. 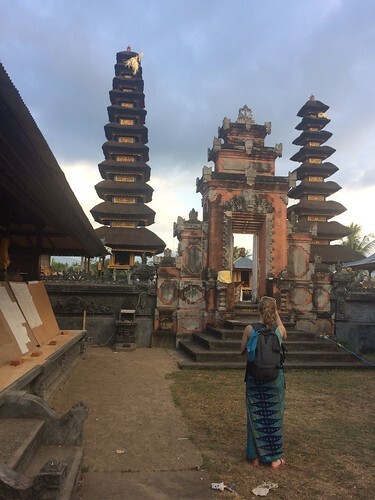 For this we had to rent a special sarong, because you are not allowed to walk around in a temple with a wet sarong. It was a very pretty temple and you could already see some of the preparations of Galungan, the holiday that was coming up. The third and last stop before we went to the hotel was Best to Buddha. At this place they make the Buddha to Buddha jewelry. Here we stayed for quite a long time and everyone bought something (except my dad). Then it was time to go to our hotel. It was very busy on the road and some road were closed. So it took some time until we reached our hotel. 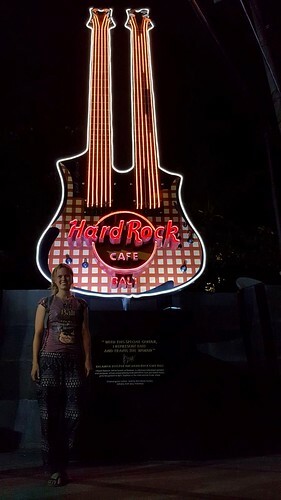 In the evening we went to eat at Hard Rock Café. Unfortunately way more expensive than all the other food that I usually eat here, happy I still had a coupon. With this we could get one of the meals for free. After eating and buying my souvenir shirt we walked around in Kuta and visited some stores. We did not buy anything that night, but Sanne did see swimwear that she really liked. 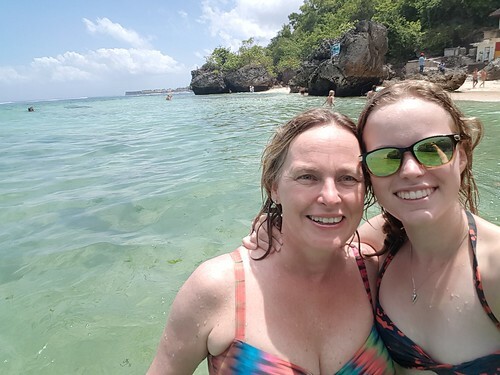 So the next morning Sanne and I went back into Kuta looking for the one store with the swimwear. We also had to hurry, so not being able to find the store at first did not really help us. 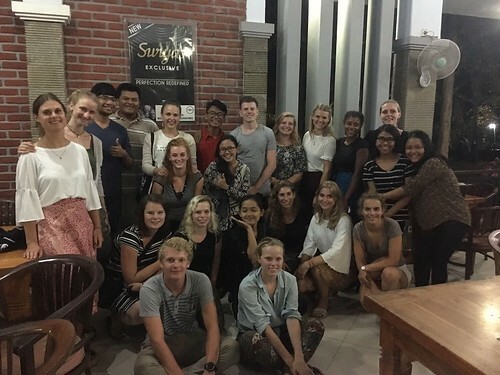 We had to be back by a certain time because Ngurah would pick us up again for the next day. After a nice walk on the beach, and walking around all the stores we finally found the store we were looking for. Here Sanne tried on and bought a bikini and a swimsuit in less than 10 minutes. After that we had to be fast going back to the hotel. We were already looking around us, because our driver would have to go over the same street but we did not see him. After finding out we were really late we took the first cab we saw to go back to the hotel. Driving in the taxi to our hotel we saw that the car in front of us Ngurah was. So if we waited 10 seconds longer we could drive with back with him to the hotel. Now we just drove the last 100 meter on the driveway of the hotel with him. 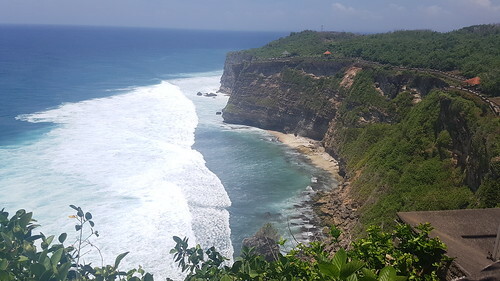 That day we went to Pedang-pedang beach and to Uluwatu. At the beach we had some time to relax, enjoy the views and to swim. It was very pretty here. 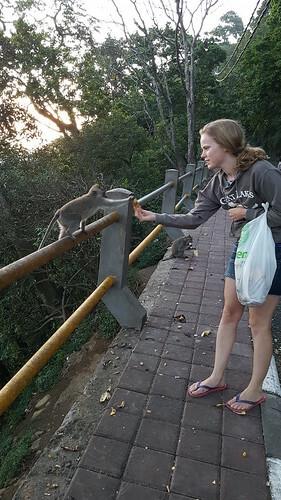 Then at Uluwatu we were warned that there were monkeys who would get anything from you that is shiny. So we left all our stuff in the car including our sunglasses. That was the worst decision ever. I am that person who cannot see when it is bright outside. So I was sitting with my eyes squeezed all the time and I got a little headache. I really missed my sunglasses during the time we were there. Then it was time to go back to the hotel already. 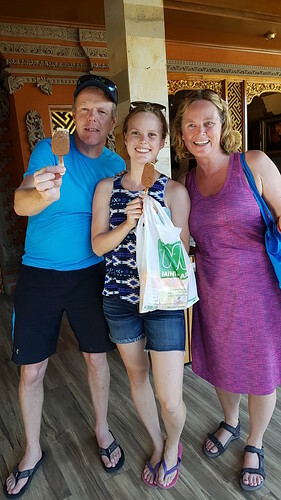 Sanne, Mylène and I got our bags at the hotel, bought some snacks at the store and got into our next taxi which was from family from Ngurah. We still had to go to the university the next day. On the way back we gave the bananas my dad bought in Singaraja to the monkeys. They didn’t really feel like taking a lot. 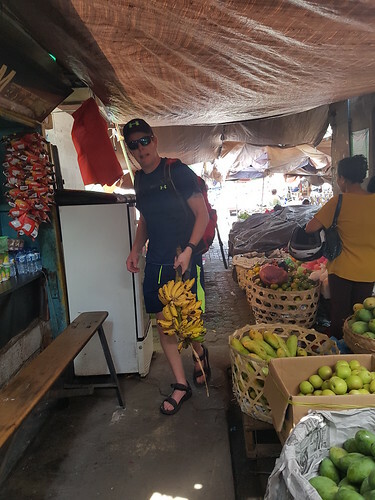 So I just put all the bananas that were left on the side of the road where the monkeys usually are. 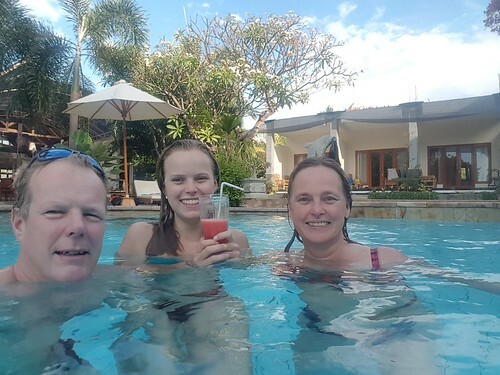 My parents would stay for a couple more days in Bali before going back to The Netherlands. 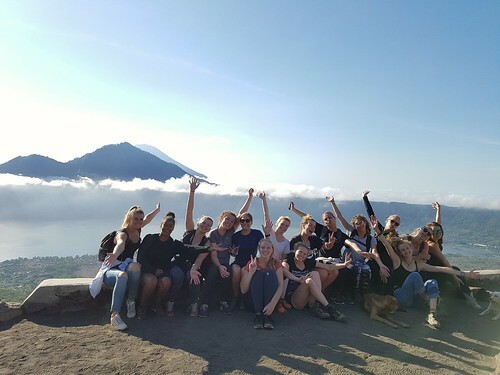 They also wrote a blog about their trip to Bali, feel free to read it at http://www.aafkeprinsen.nl/bali-2017/ ! 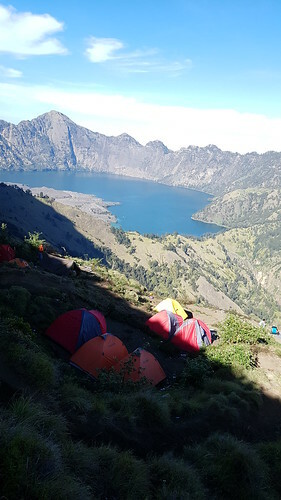 In the night I had to do my laundry very fast and pack for my next trip to the Gunung Rinjani. Monday morning I still had to go to school, but Tuesday we would be off because of Galungan. Galungan is a holiday on Bali where they celebrate that the spirits of the people who had died come back to Earth. 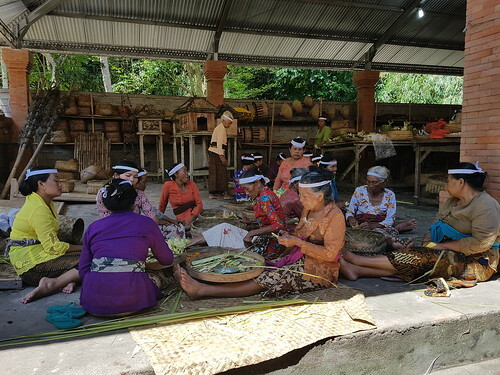 During Galungan there are a lot of ceremonies at the family temples. 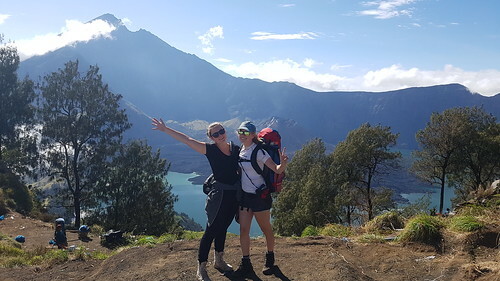 We heard that there are not really parades or something, so we decided to go to Lombok to climb the mount Rinjani during our holiday. There are people who went there by motorbike, but I decided to join the group who went with the bus. We left Monday after school. I just had a little time to buy some extra groceries for on the way and to finish packing. 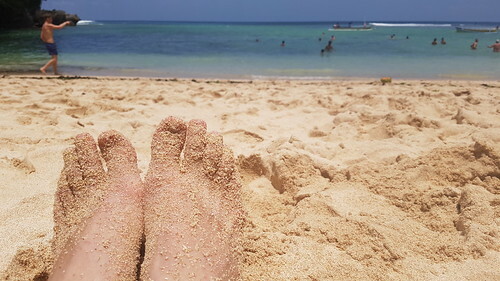 It was a long trip to Lombok. 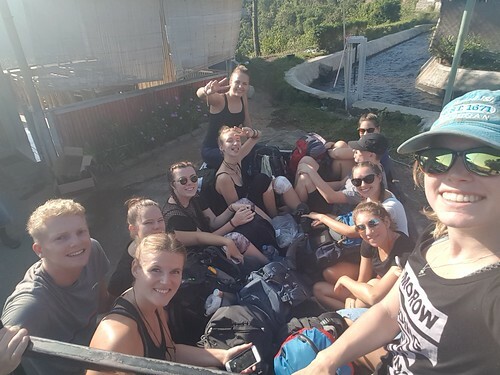 After a 3 hour dive we had to get on the boat, which took us 4 hours to get to Lombok. This was during the night. But we could not be that comfortable to get in sleep well. Towards the end of the boattrip I got so tired that I fell asleep easily. Then at Lombok the next taxi was already waiting for us with some students of the University at Lombok. These students would also be our guides the next days. 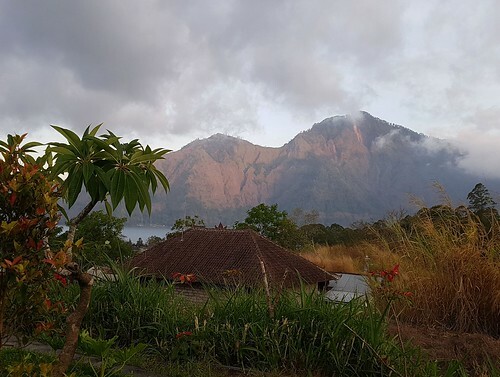 The first night we stayed at a homestay somewhere towards the East in Lombok. We arrived late at night, so the first goal was to go to sleep. I shared the room with Sanne. At this homestay many things were open which I didn’t like. 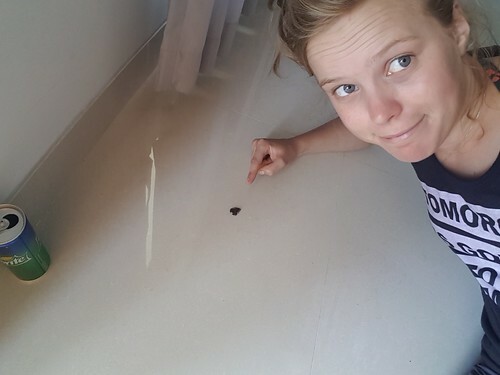 I know the malaria mosquito is active on Lombok so I did not like that our ‘window’ in the bathroom was just a hole in the wall. So we tried to keep all doors in between closed. Also from our bed we could just see the roof tiles through the hole in our ceiling. 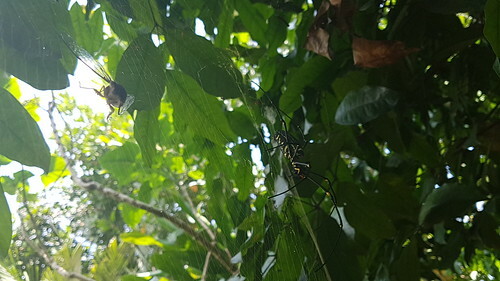 There were also huge spiders at the homestay which I didn’t see until the next day. They were as big as your hand and some might even have been bigger. 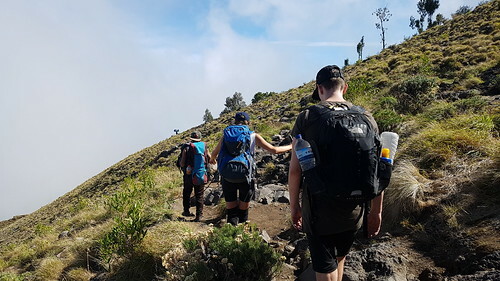 We stayed during the day at the homestay and at a shop nearby where some students bought some more stuff for during the hike, we would hike up the Rinjani with a total of 12 students. After lunch we left with a bus to the next homestay from where we would leave Wednesday morning to do the three day hike. 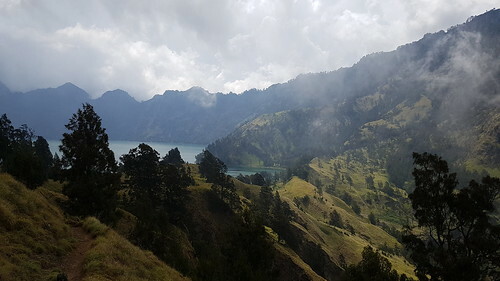 On the way we stopped at a place where we could enjoy the view of the Gunung Rinjani before we continued. Arrived at the next homestay we got our bags ready for the hike, ate, got some information for the next days and we went to sleep. On Wednesday we had to leave early for our first day hiking. After breakfast we left Sanne and Lieke behind who did not join us hiking but did other fun stuff instead. We had to sit with 12 students in the back of a truck and drive for like an hour. It was a fun experience. But just before we arrived at registration I lost my cap. So the car had to stop so I could get my cap back. The rest of the ride I just held the cap in my hands. Then it was time. We were really gonna start our hike. No turning back anymore. The first part was still a little flat, but we were walking full in the sun. So we had to drink a lot of water to stay hydrated. 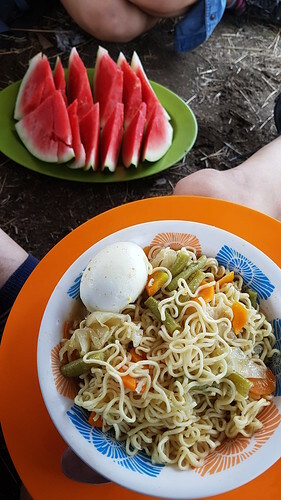 At the 2nd pos we had lunch: noodles with veggies, a boiled egg and fruit. After the lunch we had to climb further. I just walked easy because I knew I still had to save my legs for the next two days. 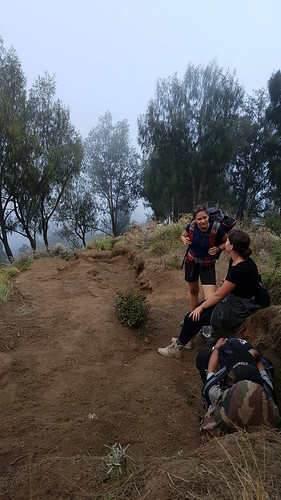 After a few hours, and a small nap of our guide, we arrived at the crater rim where we would spend our first night in tents. We arrived just in time to see part of the sunset, but after that we still had to find the rest of our group. After finding the group Mylène and I went to our tent. After dinner we went to sleep because it would be a short night. At 1.30am we woke up again. 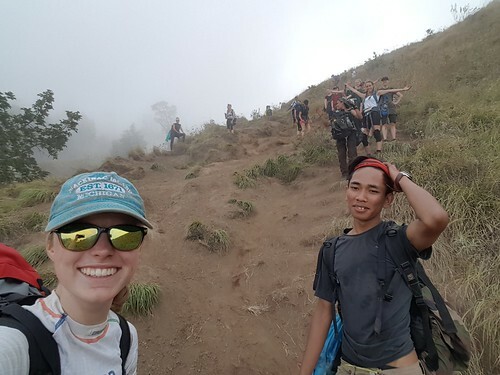 We were going to climb up to the top and see the sunrise from there. It was a very hard climb up to the top. There were parts that looked like dunes. So just a lot of sand that we had to climb up to, and it was pretty steep too. I also noticed that my body was not entirely awake yet because I had the feeling I could fall asleep while walking. It was also very cold and windy. So 200 meter before we reached the top Valerie, Merel and I decided not to go further and we made some great pictures at that point. Later Mylène and Puck came to the same spot. Mylène went down with me and Puck would try to go a little further up the mountain. 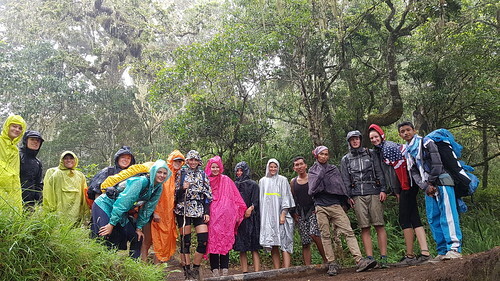 No one of our group reached the top. It would not be save there. I also heard someone saying that this climb at that day would be as hard as climbing the mount Everest. So I think I can be very proud of myself of coming that far. When we got back at the tents we ate our second breakfast before we would continue for the day. 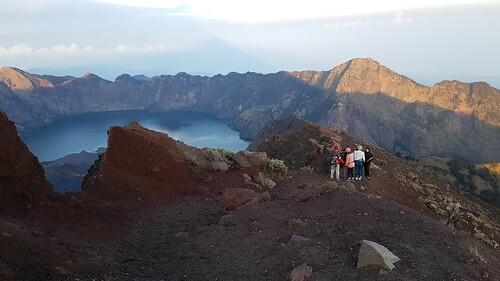 This day was going down to the lake and going up to the crater rim on the other side. I like going down a lot more than going up to be honest. Our descent took a little longer than expected. At the bottom of the crater we went to the hot water spring which is warmed up by the volcano. For me it was too hot to ‘bath’ in, so after walking further and further away I found a spot that I could handle to sit in. Only, the water was not that clean. So after smelling because we could not shower these days, we smelled even more because of the hot water spring. After the hot water spring we still had to walk up for a while. 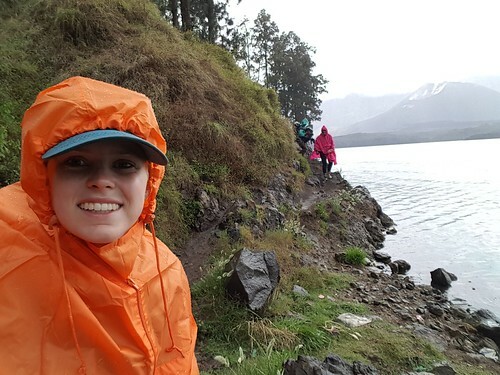 During our walk up it started to rain. So we had to get our ponchos out. After walking further for a while it started to get dark. 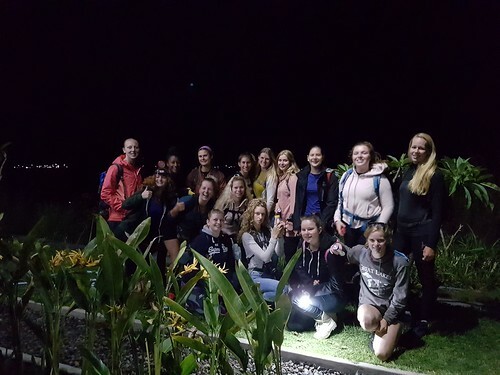 So at the end we had to walk up a scary path where we had to climb straight up with a ravine next to us in the dark. When we got up we were at the place our next camp was at. Back in the tent and after a game of UNO with some of the other students we got our dinner. The tent of Mylène and me had a problem. The zipper was broken and it could not close. Our sweet guides helped us and fixed the zipper of the tent. So after that we could go to sleep. 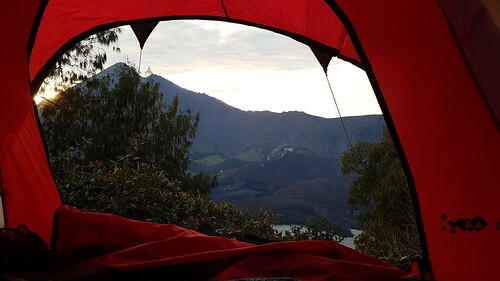 The next morning we had an amazing view from our tent. We got ready for the next hike and made a group picture. We had to wait a little before we left, because one of our group lost her phone. Unfortunately we did not find her phone. 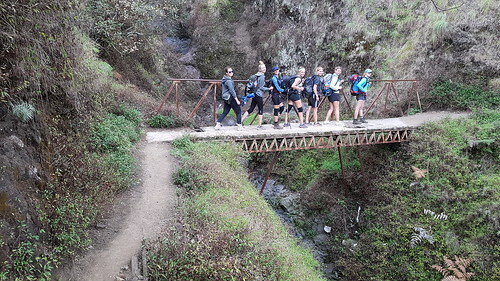 With a little delay we started the hike of our 3rd day, the descent back to the living world. On the way down we went through a jungle. 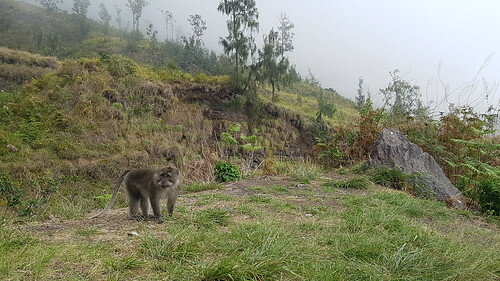 Here the monkeys were almost walking down with us. 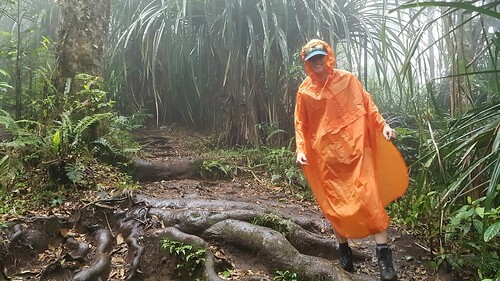 We also had rain on the way down, it looked like a rainforest. Later it didn’t rain anymore. But it still felt like rain, because water stayed dripping down the trees. After many hours we arrived down where we got picked up by a bus. This hike was so amazing! I want to thank our guides / friends for the great time I had. And I also want to say I have a lot of respect for the people carrying lots of stuff for us and preparing food. 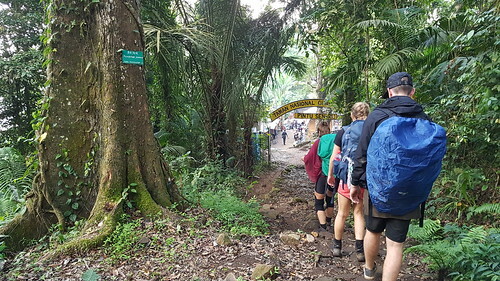 They were just walking on flipflops or bare feet up and down the mountain. 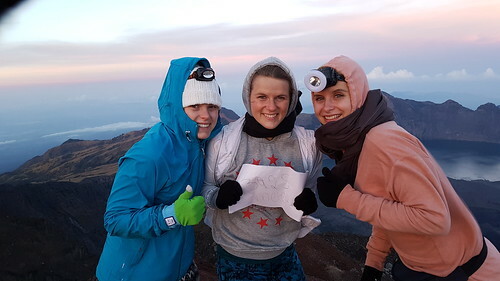 After a great week of hiking the group met up with Sanne en Lieke again. From there we went with the bus to the first homestay we stayed at in Lombok, here we got some dinner and picked up some stuff that was left there. Then from there we had to drive a couple more hours to the hotel we booked. The drive was long, but I think our driver might not have understood that we weren’t going to the harbor. He missed exits and because of that it was very late when we finally arrived at the hotel. First we were afraid all gates were closed. But after yelling for a while and trying to open the gates someone came, let us and brought us to our rooms. All of this was around 1.30am. So it was a very long day again. We just slept in the next day. 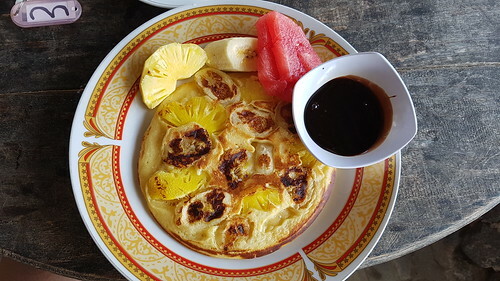 Our breakfast at the hotel was very good and we just relaxed at the beach and pool. Around 11am we left to the boat to go back to Bali. 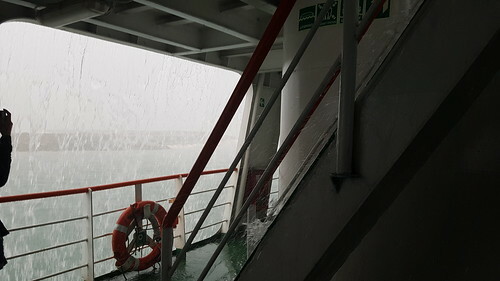 On the boat it was storming! 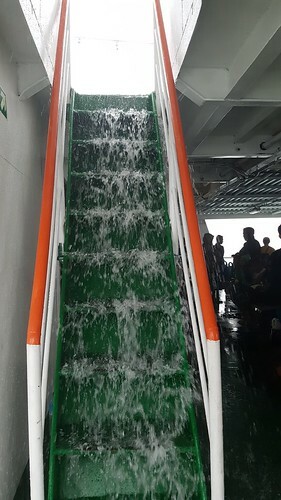 There was water everywhere. At the time I could not stay dry anymore sitting outside I went inside where it was very crowded. A couple of hours later when we were back on Bali our taxi driver was already waiting. He drove us back to Singaraja with a break to eat dinner on the way. So it was a busy week with 2 trips. On Sunday I just rested and Monday school started again with our cooking class. But I think this blog is long enough for now, so more about that the next time! I hope I get time to write soon about that soon, because I’ve done a lot more after that already. Wait.. Someone. Please tell me where the time went.. According to my agenda I have been on Bali for one month tomorrow. I really can’t believe that… Time went by way to fast. So I’ve been here for a month now and I’ve seen so much! I try to add as many pictures as possible to show everything. But my micro SD card broke so I lost many pictures.. But hopefully I’ll be able to fix that card to get my pictures back. Where to start about everything I’ve done these past weeks?! In my previous blog you could already read that we visited all projects. One day we had to wake up early to get to the next projects which are east of Singaraja. Some of the group went there by bus because they were injured, there was still some place left in the bus. So I joined them because I was still very tired. First we went to a very pretty place where we had our breakfast, or for me who doesn’t leave the house without breakfast, my second breakfast. From there we went to a town named Bengkale. In this town there are many deaf people and two students of our group work on a project at the school in Bengkale where they look at how the communication between the hearing and the deaf people/children at that schoool is. In Bengkale we could also visit the temple which was pretty cool to see. I’m also doing my project in Bengkale, but more about that later. 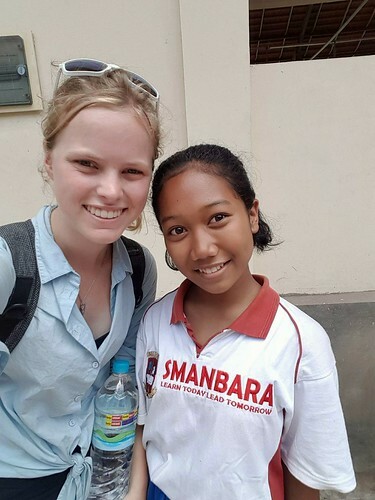 After we’ve been at the deafschool we went to Bali Mandara. This is a boarding school. Everyone had a buddy who showed them around at the campus. My buddy was Dina. She spoke good English! And making the big world small. She applied for the YES exchange program once, this is the scholarship AFS works with in the USA. Unfortunately there were many people who applied and she didn’t make it. After visiting Bali Mandara we went to Air Sanih, this is a cold water spring. We stayed there for a couple of hours to ‘rest’. So all we did there was swimming and relaxing. In the evening we went back to Bengkale. Here we watched the ‘deaf dance’. This means that the deaf people of the town were dancing. It was interesting to see. But also pretty short. We had to go over a pretty scary road to go to the place where the deaf people danced. Afterwards we had to go down that road before it got dark. Because of this we couldn’t go to the disabled people in the village who would give us a workshop of making traditional inke baskets. When I got home at night I went together with Sanne to the hospital. She got sick that day and we wanted to make sure it wasn’t a scary infection. Luckily it wasn’t too bad. So after she got lots of unnecessary medications we went back home. The next day we went to the local hospitals. People here loved to show to show you around. So they were very proud to show me the mortuary. The man also opened one of the ‘fridges’ where the bodies were in. I’m happy that person was covered in a blanket. The interesting part about the hospital is to see many people waiting outside rooms. This is family of the patients. The reason they are there is to care for their family. The hospital provides the healthcare / medicines that is needed. But does not bring food of drinks. So the family has to make sure the patient gets food and other stuff that’s needed. After visiting the hospital I left the group for a small moment to check on Sanne who stayed home that day. I just had to make sure her fever wasn’t too high and that she was not feeling too bad. After that I joined the group again at the orphanage where some of us do a project. Then there was a day more projects were visited. But I didn’t join the group that day because Sanne felt really bad that night. I stayed home with her because it was not good to leave her at home while the group was 1 hour away. We just slept in (which was very good for my tiredness) and did easy all day. Also we worked on our papers and started preparing for our ‘presentation’ the next day, Friday October 6th. The evening of the 6th of October we came together with almost everyone from all projects. This evening we could meet some other students and talk to everyone. There wasn’t really time for all our presentations about stuff in The Netherlands. So we ended up doing some karaoke and the ‘kabouter plop dans’. I also called my American AFS sister who is staying with my parents that night. It was her birthday that day! Her Dutch is getting very good now, and I’m really proud of her! Figuring out what my project would be was kinda hard. I stopped by a foundation, Stepping Stones, who helps children with clubfeet. They are mainly helping the kids to recover from this. My education is more about how to live with something by using technology / special devices. So it was hard to get a good project from here. And also, they already had two Dutch students working there. At Stepping Stones they told me about another foundation in Lovina, that foundation works a lot with wheelchairs and maybe they had a very interesting project for me. But unfortunately this didn’t work out. At the other foundation they’re not used to work with students and they had stuff going on. So I couldn’t go there.. So now I ended up in Bengkale. 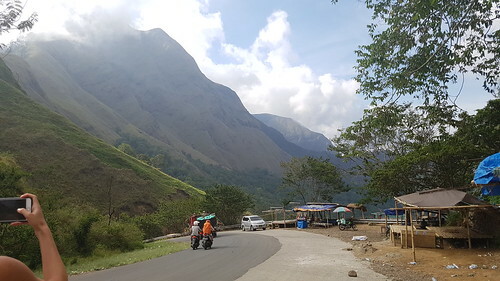 This is a small village east of Singaraja. At this village it is my task to get in touch with the disabled people and see what their needs are. Maybe I can adapt to that and help them to get special devices so they could live easier. I’ve been at my project a couple of times now, but unfortunately I couldn’t get in touch with the disabled people yet. First I’ll have to learn how to make a inke basket myself according to the person who is showing me around. So up until now I’m making baskets during my project. Hopefully I’ll be able to get in touch with the people soon so I could really start my project. I do see stuff now, but not the stuff I need to see. I’ve already been to a ‘deaf’ meeting and today to another meeting about tourism in Bengkale. It surprised me I could understand what the meeting was about. But I really hope I will be able to get in touch with the physically disabled people soon. So as you guys know. I’m here for school. This also means I have to go to the local university. I go here two days a week, on Monday and on Tuesday. 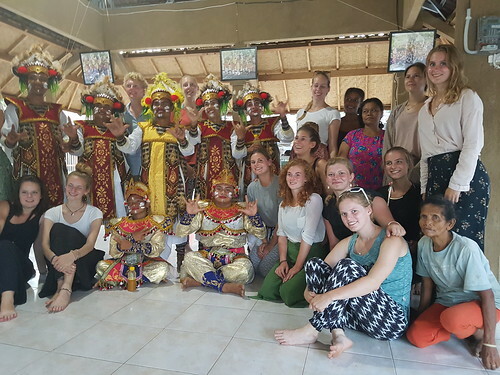 During the classes at Undiskha we learn about the language, Bahasa Indonesia, and about the culture. The days at school aren’t that long. We start at 9.30am. Then around 11am we have a 30 minute break and we are done around 1pm. Up until now I’ve had 4 days at school where we learned some of the basics of the language. Also, there is a holiday next week. 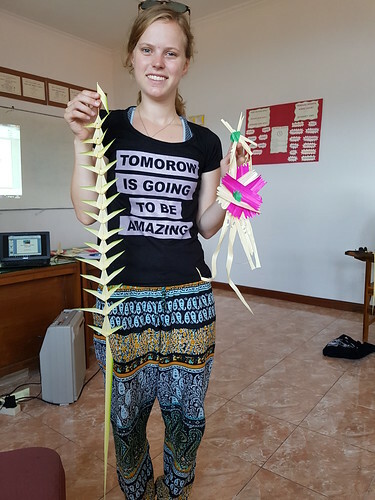 So yesterday they taught us about that holiday, Galungan, and we made some typical Balinese decorations. Some people are asking me if I’m really here for school or if I’m only doing fun stuff. So I decided to write the more serious stuff first. But of course I can’t forget to write about all the fun stuff I did in my free hours! In weekends we usually try to do stuff here. There was one long weekend we had, the weekend after our ‘presentations’. 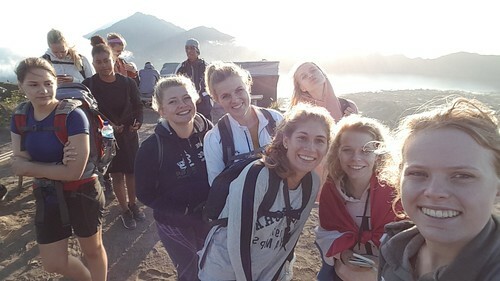 Almost our whole group left that weekend to Kuta. 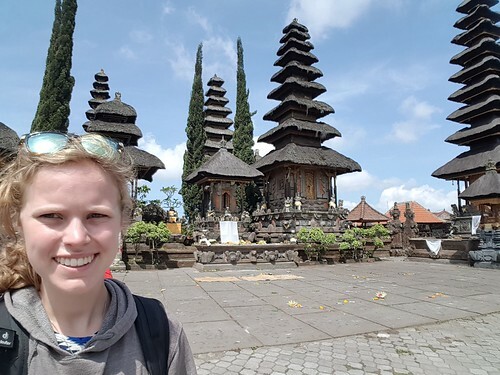 But because Sanne was sick earlier that week and I was really tired, we stayed in Singaraja where we’ve still seen a lot. On Saturday we woke up very early to see the dolphins with Nicole and Inske. 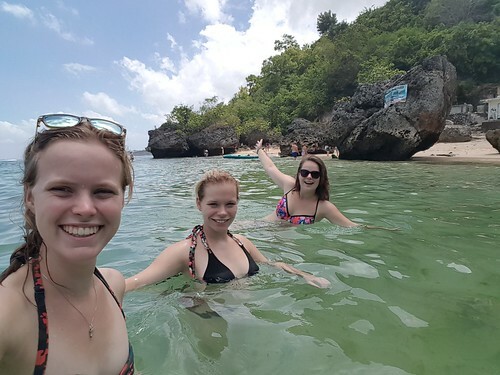 They are two other students who are for their study on Bali. They work at the foundation of Stepping Stones where I was earlier that week to see if there were any options to do my project there. Watching the dolphins was so pretty!! There were many many dolphins! You can see shots of it in my vlog that I made earlier this month. On Sunday Sanne and I decided to see if there were any nice pools around. But at many hotels they ask an entrance fee. We ended up at one of the most beautiful pools ever where we only had to buy a drink. Later we found out that there was a miscommunication. So next time we will also have to pay an entrance fee here..
On Monday we were also off. That day we decided to go snorkeling at Menjangan Island. 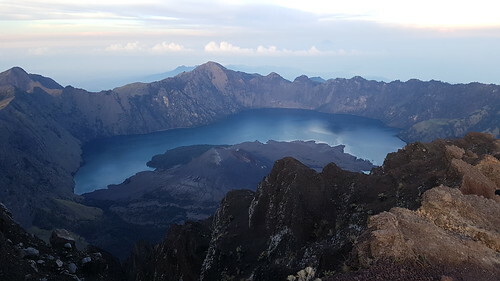 This is the island all the way in the north-west of Bali. I got a pretty bad sunburn, but it didn’t make my experience any less amazing. The snorkeling there made me decide to start diving lessons, I just wanted to go deeper all the time. But this is not possible with only snorkeling stuff. So… Diving classes. Yeah that’s what you read. I started diving classes. The packet I got is for open water diving. In total for this I’ll have 3 days of lessons. I already finished the first two. 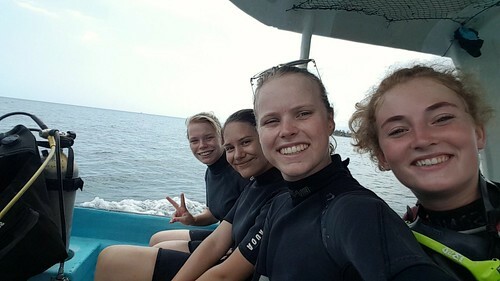 I’m doing the diving lessons together with 3 other students of our group: Sanne, Maud and Puck. We started off in a very small pool where we had some basic exercises that we had to do. We did our second diving day on Monday after school. Then we went into the sea by Lovina. We did two dives here. I really like the feeling of almost no gravity and seeing the fish swimming around you. We went down to 12 meters deep this day. 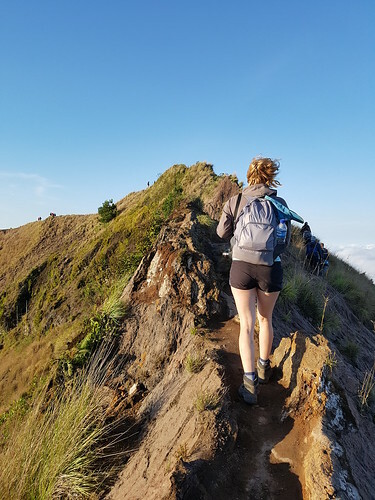 Last weekend we decided to go to climb the Mount Batur. 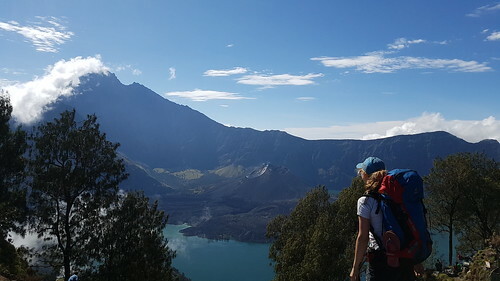 This is one of volcanoes on Bali. 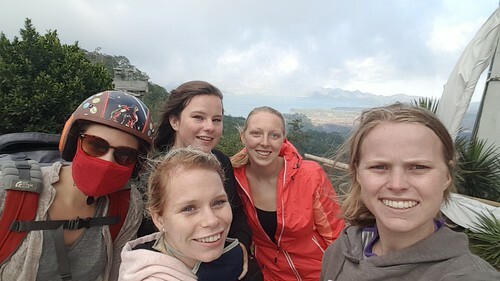 On Friday I left together with Sanne, Mylène, Lieke and Puck to a hotel close to the volcano. The view from our hotel was amazing. 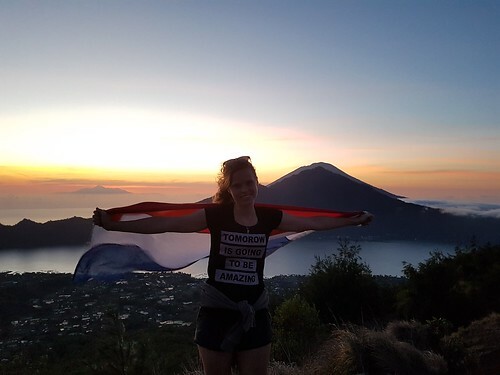 On the one side we had mount batur and on the other side lake batur and another mountain. We stayed at the hotel so we didn’t have to wake up too early the next morning. It was still very early tho.. Because we had to be ready to leave for our hike at 3.30am. In the morning other students of our group joined us to go hiking up the mountain. 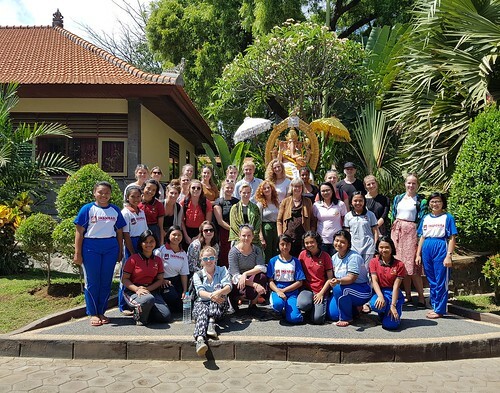 They stayed in the weekend in Ubud and left from there. 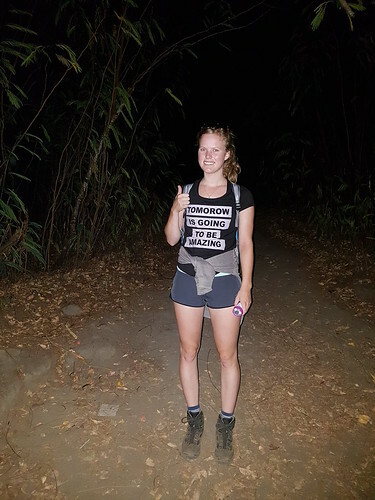 Around 4am everyone was ready to leave to hike up the Mount Batur. It was still dark outside, so everyone had a flashlight. 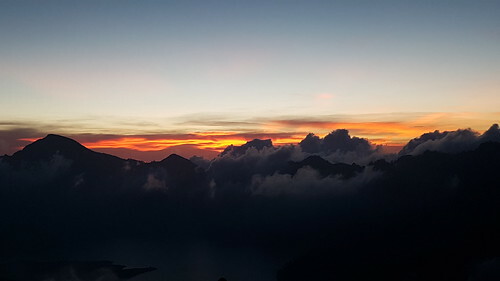 We walked quite fast up the volcano, we had to be on top before the sun rises. The views were very beautiful from the top. Up in the mountains it is a lot colder, so I was happy I brought my hoodie with me. There were also some places where steam came out of the volcano, so there I could also warm up. On the way down we took another route. 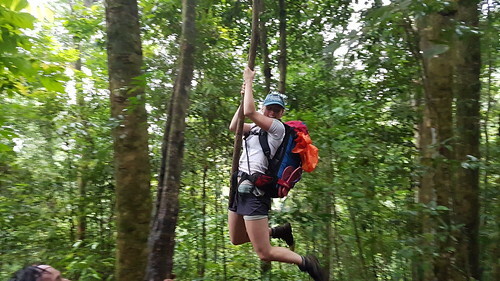 On this route we also passed wild monkeys. They kinda wanted to have everything you had. So one first sat down on my lap and then he went for my phone. He started chewing on it. Because of that I have 2 wonderful holes in my screen protector as souvenir.. Another monkey just sat down on my shoulder. I already made sure someone else held my stuff so they couldn’t steal anything. 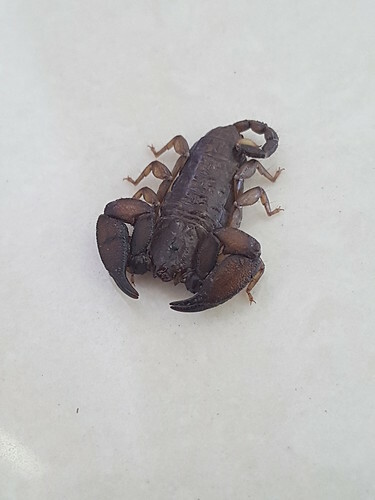 When we came back from our hike around 9.30am we found a mini scorpion in our room. We first thought it was dead. But when we found out it was alive we asked the people of the hotel to get rid of it. After that we got our breakfast and we just chilled at the pool of the hotel which was really nice and warm. On our way back to Singaraja we decided to stop by the temple on the way. They say this is the 2nd biggest and / or most important temple of Bali. I’m not entirely sure which one it was. At the temple there was also a group of people who made a group picture. They saw us and they insisted on making the group picture with us. 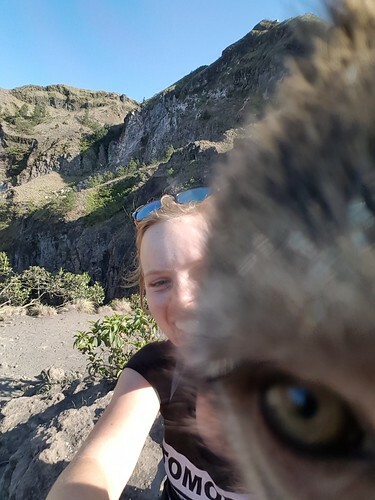 This happens quite often here on Bali, that people want to take pictures with you. On Sunday we had a surprise party for Sjoerd, one of my roommates. It was his birthday and he wasn’t home all day. We decided to surprise him with the whole group. The surprise worked! He didn’t see it coming! So everything was perfect! I guess that was about everything. I’m so sorry that my blog is that long again. I have no idea how people could write short blogs. The coming weeks I’m already fully planned, so I keep busy. Right at this moment my parents are on Bali too. 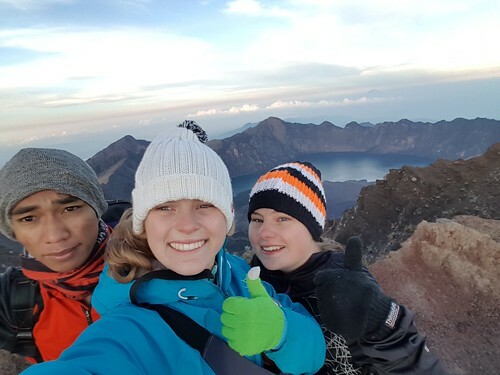 So I’ll meet with them tomorrow and then Sanne, Mylène and I will join them in the weekend in the South of Bali. 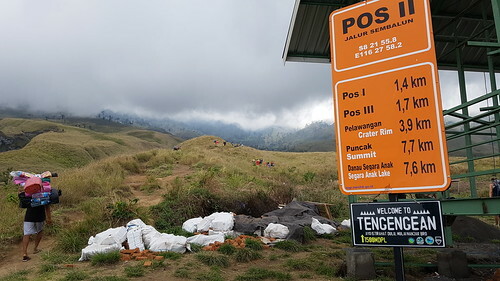 Then next week it is Galungan here, which means there won’t be school on Tuesday and no project the rest of the week. 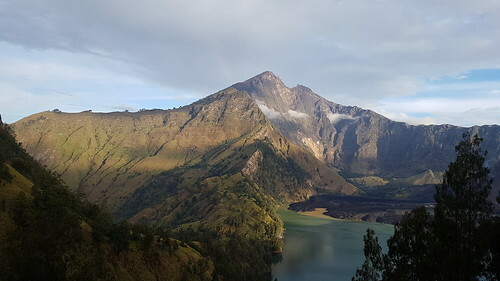 So I’ll be going to the Rinjani volcano on Lombok for a 3 day hike. I’m very excited to do that! I’ll try to keep you up to date! Hey everyone, here my first vlog in Bali! I hope you enjoy it! Many people asked me if I was here for school or holiday. The answer is for school, but these first weeks we’ve seen a lot. I also didn’t put shots at the projects in my video now. Also due to privacy reasons. And of course not everything here is fun to see. I see lots of poor people, stray dogs and garbage around. Maybe I can show you this somewhere in the future. But for now I just put shots in there which show how beautiful Bali is.